Try out this fun and unique way of learning about and exploring the Valley. Agents of Discovery is a free educational mobile game for families that uses augmented reality and location-based challenges to get people active and outdoors. 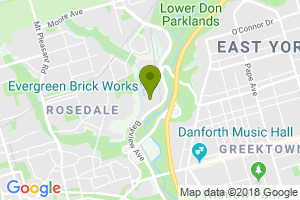 Become a secret agent as you complete the 3 missions at the Don Valley Brick Works Park, Evergreen Brick Works, and the Lower Don Trail: Riverdale Park West the Bloor Viaduct and learn about the rich history and unique ecology of this place. Agents who complete each mission can pick up their prize from the Welcome Desk in the Young Welcome Centre at Evergreen Brick Works during its open hours. Please always follow City of Toronto bylaws when in the Don Valley Brick Works Park. Simply download the Agents of Discovery mobile app from https://agentsofdiscovery.com/play/ and select your mission next time you visit. Have fun! Download the app and play with your family on your next visit!